Holland or Germany, 1605. Panel: 9 1/2” x 15”. Case: 11 1/2’ X 17"
A vibrant, and unusually artful large-scaled folk art painting of Lake George; signed and dated by the New York artist Ralph Redpath. 41 ¼” x 30 ½” framed. A fine pair of pastels on paper of Peter and Catherine Post Ritter, attrib. to Gerrit Schipper, c.1802-07. Born in Amsterdam in 1775, Schipper worked in New York, Charleston, Savannah, and Massachusetts from 1802 until 1807. Peter and Catherine Post Ritter were residents of New York City and are buried there at St. George’s Church. Information on Catherine Post can be found in E. Moore Green, J.W. Jordan, and G.T. Ettinger, Douglass and Post Genealogy, 1905. An unusually expressive portrait of a young child holding a mug. Attributed to William Matthew Prior. Oil on academy board in excellent condition; in period but not original frame. 10 ¼” x 14 ¾” (sight); 14 ½” x 17 ¼” (framed). Unlike most primitive portraits of children by Prior, this painting truly conveys a sense of the sitter and the emotion this child is feeling at being made to sit for this portrait. The expression on his face is that of a young child feeling both impatience and resignation… a wish for this “sitting" to be over. England, prob. West Country, late 16th-early 17th c. A wonderfully folky pair of carved oak panels depicting Adam and Eve. 8 ¼” x 15 ¾” each. New York or New Jersey, c. 1810. A very fine portrait of John Henry Livingston, the leader of the Dutch Reformed Church in America, and President Pro Tempore of Queen's College (later Rutgers). 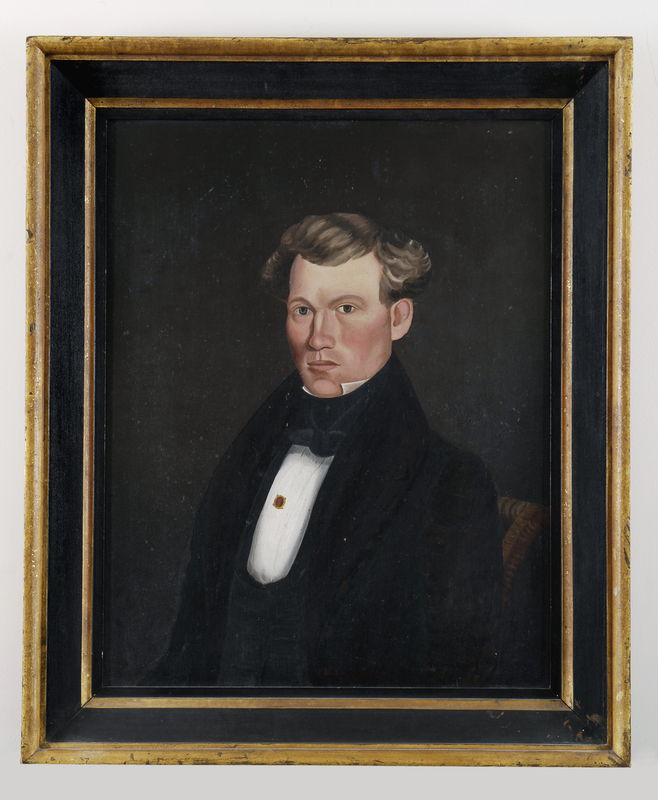 Several nearly identical versions of this painting exist and are in the collections of The New York Historical Society and Rutgers University. 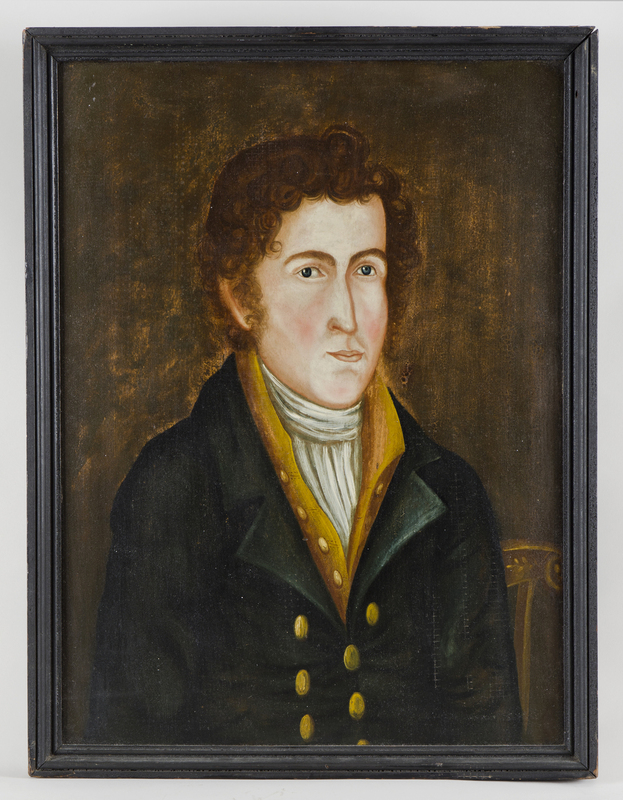 In her book, A Portrait of Livingston Manor 1686-1850, Ruth Piwonka attributes this painting to G.D. Abraham Tuthill, New York or New Jersey, c. 1810. Oil on canvas; relined, with two minor 3" l. slits repaired bottom center. 28 1/2" x 34" framed. Unusually sensitive marble carving of Moses. 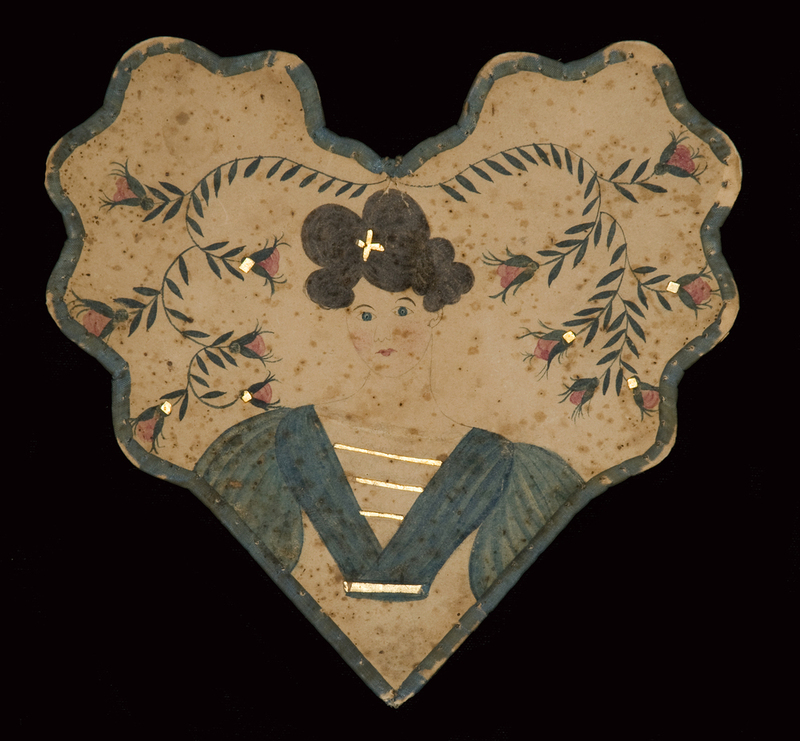 Charming portrait on a heart-shaped board, no doubt given as a token of love. A bold, yet sensitive early folk art portrait of a young man sitting in a decorated chair by Asahel Powers. Oil on poplar panel in distinctive original frame. Very minor touch-up in upper left background above head. Attributed to Milton Hopkins, though possibly Noah North. In exceptional condition, on poplar board, in original painted frame.